As a content editor, when using the external link dialog in CKEditor, I expect the value always to be rendered as is when "Other" protocol is selected. 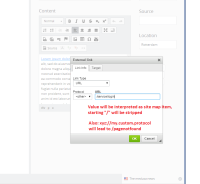 Currently, when the value does not start with "http:", "https:","webdav:", "ftp:", "mailto:", "#", "callto:", "data:", "tel:" "sms:" or "$", HST's SimpleContentRewriter tries to interpret it as site map item. This goes wrong when the value is meant to be relative to the domain, so starting with "/": the rendered URL is prefixed with mount path (like /nl or /de for language channels). But moreover: it you selected "Other" and enter "xyz://my.custom.protocol", the rendered link is a /pagenotfound! Here also, I'd expect the full value to be rendered. So how about reversing the logic for externals and render links as is if they are not internal links?